Building on an over five-year, almost entirely fictional narrative about a popular uprising in Syria, recent developments on the ground in Aleppo have triggered a new propaganda blitz complete with a new set of provable lies. The following are ten facts about Aleppo that must be accepted by any objective, informed and rational observer regardless of one’s political views and opinions regarding Syria. 1) Eastern Aleppo was overrun by a foreign-backed, Al-Qaeda-led terrorist alliance in 2012. At that time, approximately 600,000 Aleppans fled eastern Aleppo for the security and safety of western Aleppo where the Syrian government maintained control. 2) Estimates of how many civilians remained in eastern Aleppo vary widely, but official estimates place the number between 100 and 150 thousand. UN estimates of up to 300,000 are almost certainly inflated and politically motivated. 3) Eighty to eighty-five percent of the armed fighters in eastern Aleppo belong to the Jabhat Al-Nusra, the official Al-Qaeda affiliate in Syria that just underwent a rebranding, complete with a new name and logo (see image above, top row, second from the left). The remaining fighters belong to twenty-two (there are constant splits, mergers, and rebranding among them) terrorist groups that all share the same jihadi ideology, methods, and objectives as Al-Qaeda. 4) The overwhelming majority of Syrian fighters in eastern Aleppo are not from Aleppo itself, belying the notion that any part of the city rose up against the government. 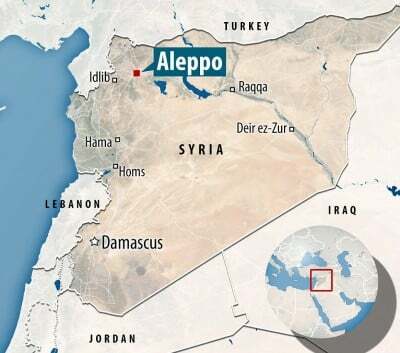 5) The terrorist groups in Aleppo include a large number of foreign fighters from eighty-one different countries with significant contingents from Turkey, the Gulf Arab states, North Africa, and Russia’s Chechnya and North Caucasus region. 6) Armed groups in eastern Aleppo have been deliberately shelling civilians in western Aleppo. This has led to angry protests against the Syrian government demanding an end to the shelling and the complete extirpation of the terrorist presence in eastern Aleppo. 7) This past week eastern Aleppo was finally completely encircled by the Syrian Army, effectively cutting off the terrorist groups’ supply routes from Turkey. 8) The Syrian government has offered all Syrian fighters in eastern Aleppo amnesty in exchange for laying down their weapons and surrendering to the Syrian authorities. 9) The Syrian military has also established three humanitarian corridors for civilians to exit eastern Aleppo. The Syrian government had prepared 10,000 habitable apartment units in western Aleppo for civilians fleeing in anticipation of a possible final battle. As dozens of families started to exit armed groups immediately began preventing civilians from leaving, prompting speculation they intend to use them as human shields when and if the Syrian Army begins its final entry into the eastern part of the city. 10) After completing the encirclement of eastern Aleppo the Syrian government, in a joint mission with the Russian Air Force based at Hemeimeem Air Base, began a massive humanitarian airlift into eastern Aleppo. The tragic shoot down of the Russian helicopter this week took place as it was returning from a humanitarian aid delivery.